Anne Hathaway's got a fiery new hair color — see the pic! No stranger to having fun with her locks, the star is at it again. Anne Hathaway has a fiery new 'do, just in time for Thanksgiving! The Oscar-winning actress, 36, was spotted rocking a deep red hue while in New York City this week, and definitely made us do a double take. It's been a busy season of new hair colors for Hathaway, who most recently returned to her signature brunette locks for the Hollywood Film Awards earlier this month. Back in September, the "Ocean's 8" star flirted with a coppery hue at Paris Fashion Week. She also sported a red-meets-brown color at the Human Rights Campaign National Dinner the same month. 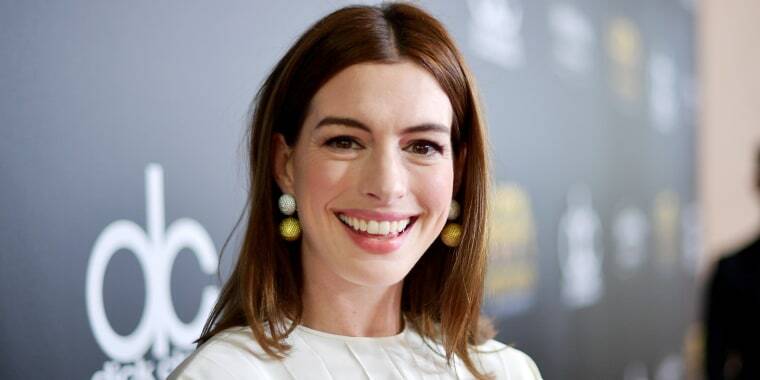 Hathaway typically sticks with her classic brown locks but she has been known to switch things up on occasion. Take her stint as a blonde in 2013, for instance. The actress also tested the "Short hair, don't hair" theory when she cut her long locks into a bold pixie cut for "Les Miserables." It's too soon to tell whether the actress personally chose the new rich red color or if it's for a role, but one thing's certain: She's definitely rocking that red!